Ben There, Dan That and its sequel Time Gentleman, Please! are excellent point-and-click romps with good gags, squabbling protagonists and, yes, quite a few puzzles. It's been a long time since Size Five Games' titular reluctant adventurers have left the comfort of their sofa, but they've finally found themselves embroiled in another fiasco in Lair of the Clockwork God, an adventure game that is also, equally but kind of separately, a platformer. While previous Ben and Dan adventures have been firmly rooted in LucasArts romps like fellow duo Sam and Max, times have changed. 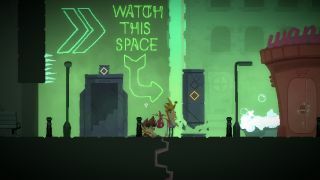 Dan reckons the future is in indie platformers, so he's a bouncy bloke who jumps around and pushing massive crates and stuff, as platformer protagonists do. Ben, meanwhile, hasn't given up on point-and-click adventures, so he approaches everything like your Threepwoods and your Wilcos, mucking around with items and smooshing them together in his inventory. Neither of them will be able to make much progress alone, but by combining their talents, they'll have more luck. Check out the trailer below to see how it works. Dan can bound around, using his double jump to get to places ordinary, not-bouncy humans can't, like a wrecked plane perched on a tree, and then use his inhuman strength to push it over. On the ground, Ben can then use items from his inventory to bring the propeller back to life, turning it into a saw that his pal can use to chop down the aforementioned tree. Teamwork! It's not so much a hybrid as it is two distinct genres that work together, and judging by the trailer, pretty well. And thank goodness it's still funny, with the gentle mocking of adventure game conventions now joined by platformer gags. Also, Dan can carry his mate on his back, the purist expression of friendship. Lovely. Lair of the Clockwork God is due out this year.